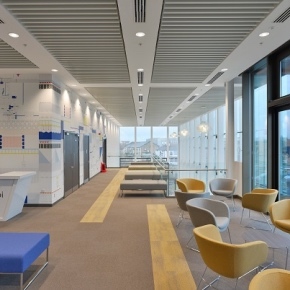 The £38 million facility, developed as part of the Strategy for UK Life Sciences programme, is designed for for conducting research on biologic products by promoting collaboration between academia, the NHS and industry. The 5,000m2 medical research centre features laboratory and pilot plant areas, dedicated spaces for Good Manufacturing Practices (GMP) process, analytical and technological development, clean rooms for research, in addition to offices and spaces for meetings, training and conferencing. V-P 500 perforated metal baffles (1534mm x 150mm x 30mm) at 125mm centres in break-out areas and the double-height reception area. D-H 700 floating raft ceiling, comprising 2140mm x 500mm x 30mm microperforated panels with acoustic fleece hung from a U-profile grid system, also used in the reception area. Ultima+ Vector tiles (600mm x 600mm) on a 24mm grid in offices, corridors and stairwells (Cradle to Cradle certified). The products were specified by NORR, who commented that Armstrong systems were chosen for their aesthetics and ‘excellent’ pre-specifications service. A spokesperson from the company elaborated: “The client is very happy with the Armstrong systems. Quite often ceilings are missed out but the Armstrong systems enhance the space while providing access, ventilation and acoustic performance. The details were very straightforward to create. The ceiling systems were installed in the steel-framed building for contractor Interserve, over a three month period by a team of 16 specialists at Interceil.